We’ve been teased with a little sunshine, and the weather reports are promising a heatwave. Our fingers are firmly crossed. We’re not quite into festival season just yet, but the Coachella style showdown always gets us planning our summer wardrobes. Who needs an excuse anyway? What looks will you be going for? Seventies hippy vibes or rock star chic? Cyber sports or cool kid casual? We love the thought of prancing around on the sun soaked Cali grass, but in reality, we’re thinking T in the Park, Lovebox, Parklife and Bestival. That’s a lot of outfits. When it comes to festival style inspiration usually we look no further than Alexa and the Kates (Moss and Bosworth, natch). In our eyes, they’re the true festival style queens, and between them, they have it nailed. Their gladiator and ankle boot collections are off the charts. 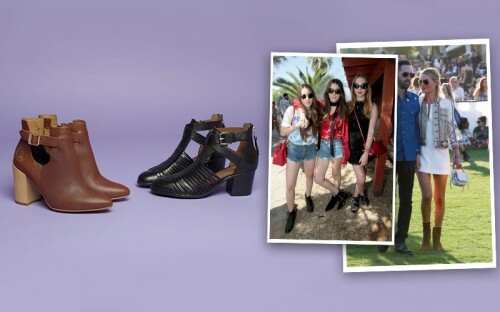 Here are some of our favourite Coachella looks and how to start building your version, from the shoes up. Our girl crush Haim always look hot. They rocked some classic black ankle boots, literally festival dressing 101. They go with anything and a mid to low heel means you can wear them all day and night, cut outs optional. Get the look with schuh Rehearsal, and Red or Dead Treasure in black or tan. Bella Thorne has pool party chic down. That crown. Those legs. Those Jelly shoes. What a combo. Jourdan Dunn keeps it simple in a minimal Moschino baseball shirt dress paired with black Timberland 6 Inch boots. Festival stomping boots at their best. It’s rumoured Alexa was sporting a $5000 Chloe maxi dress while DJing (cringe) at a pool party. A little extravagant if you ask us, but her black flat sandals with wide straps are on point. We’ve loads of styles to choose from but our current faves are Barcelona and Vacation. 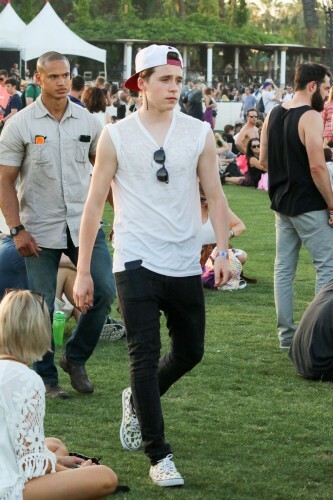 Not forgetting the boys, we spotted aspiring model Brooklyn Beckham sporting a pair of fresh Drained and Confused Vans. The new release features an all over skull/pineapple print – it’s totally tropical and a sure summer winner.